RugbyRefs.com is pleased to be able to bring you the full appointments for match officials for rounds 3 & 4 of the 2015 Australian National Rugby Championships. As we approach the start of the 2015 Rugby World Cup in England, we are going to look at what the term 'Clear & Obvious' means to a referee, and the greater team of 4 in general. During the world cup, the match officials will be under a greater degree of scrutiny than has ever been seen before, the desire to get every decision correct is there, but perfection is something even that even the best teams have not yet achieved. Perfection for a team would surely mean that no player drops a ball, every pass goes where intended, every tackle is made, and every kick is successful. However, as supporters we understand that this is near impossible to do over a full 80 minutes. The dynamics of the game, along with the unpredictability of the opposition defence means that mistakes will happen, but it's how you over come them that really defines the team. John Lacey is a classic example of a "poacher turned gamekeeper". He was born in Tipperary on 12 October 1973, making him 41 heading into this years Rugby World Cup. John Lacey played rugby professionally on the wing, or at full back for Munster, scoring 114 tries at Senior club level. Debuting for Munster at the tender age of 18, he made six Heineken Cup appearances for the province. 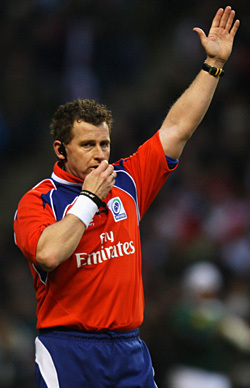 He is one of two referees at this years Rugby World Cup who have played professionally as well, the other being New Zealand's Glen Jackson. Is there anything to say a referee must wear rugby boots? I'm thinking the ground will be hard over the weekend and my Inox fell/trail shoes would grip better and be faster and more comfy than my old faithful Adidas Flankers! Offence warranting YC the. Try, go back and YC? Chaps, I've newly passed my Level 1 Refs Course. I'm looking for the age variations for U13-U18 levels. The SRU site isn't displaying these. Can any of my fellow SRU refs give me the variations please? All times are GMT +1. The time now is 20:04.